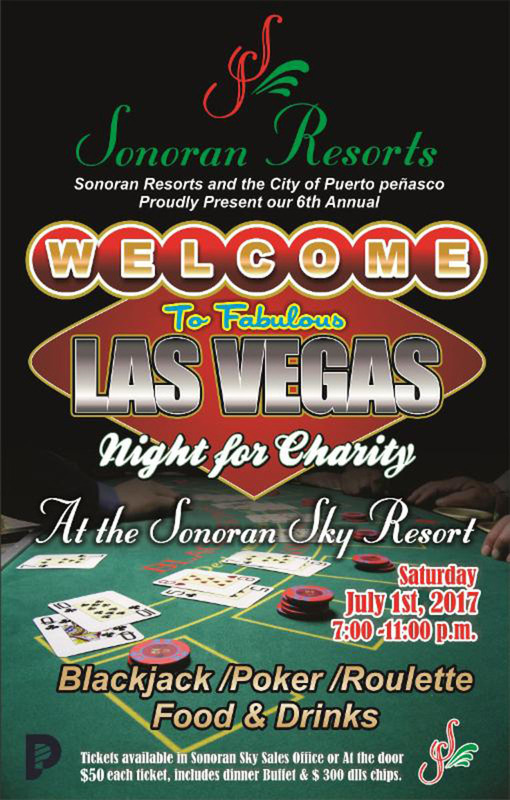 Home » Rocky Point Times » 6th Annual Sonoran Resorts Las Vegas Night for Charity is Saturday July 1st! It’s a darn good thing that we can’t have too much fun! If that were the case, we’d have to put a restrictor plate on Las Vegas Night each year! That’s because this great charity event has evolved into one of the most anticipated and fun annual traditions that takes place in our little slice of paradise by the sea. When you think about it, the formula for this important fundraising event just lends itself to having fun, and attracts the fun-loving Rocky Point visitors and residents alike. So you’ve got a large room full of happy people who are getting to play casino games like Black Jack, Roulette, Prize Wheel and others with virtually no risk of losing your shirt. Yet, if you “break the bank” you can use your winnings to bid on fabulous valuable prizes! All the while socializing with old friends and new acquaintances of like-minded folks and knowing you are contributing to a very important cause. Doesn’t that sound like a lot of fun to you as well? This is why we sell out every year and why so many keep returning to have more and more fun each year, too. Every year the prizes for the raffles and the auction donated by our generous business sector continue to grow in number and quality. That is a great testament to the compassion of our community for citizens in need of help. Las Vegas Night for Charity is the perfect win-win formula for the whole community! If you have yet to attend this classic affair, why not make this year the year you give hope to a deserving family and give yourself the opportunity to go home with a beautiful work of art or other treasure that will remind you of your own generous spirit for years to come! Each year we put every penny raised at Las Vegas Night for Charity toward a good local cause. Last year we painted an entire school inside and out in addition to providing them with much needed equipment and supplies. The year before we used the funds from Las Vegas Night to provide the local senior retirement home with A/C units. We made badly needed repairs and stocked them with other much needed equipment and supplies for roof and plumbing repairs. 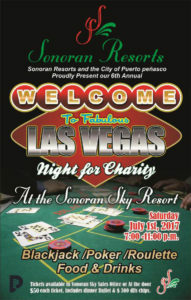 The fun starts Saturday night, July 1st at 7:00 PM in the large beachfront dining area adjacent to La Cantina Sports Bar in the Sonoran Sky Resort where you will exchange your $50 US Dollar donation for $300 dollars in casino chips, your first raffle ticket, another ticket for the fabulous buffet and a very nice gift bag strong enough to hold about 30 pounds of chips you can win (or purchase at 10 for a dollar) to use for bidding during the auction later on. The fully stocked cash bar is located in La Cantina just a few steps away. And be sure to look up Charlie Muratore at the Tequila Peñasco tasting table and get your night started off right with a free taste of his deluxe Tequilas. You deserve it. Your generosity deserves it.